The first bottle to open was this Shloer Spritzed Grapefruit and Mint drink. It is in a nice posh bottle, and is a pretty pink colour. 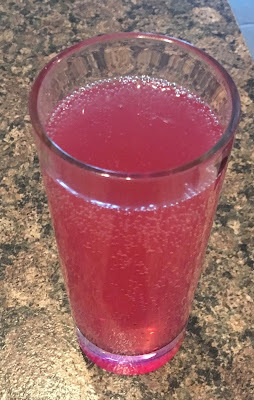 We poured some into glasses, and the drink fizzed pleasingly when poured. The aroma was very bitter and I worried his might not be for me. I gave it a sip and was pleased to say I loved the flavour. It is quite dry in taste, but not sharp from the grapefruit, just fruity and with a wave of bitter. The mint follows through and lifts this drink perfectly, its herby taste is cooling and refreshing, and rounded off the flavour perfectly. If I didn’t have cupboard full of new Shloer flavours to try I would be buying another bottle of this Shloer Spritzed Grapefruit and Mint for next week. I’m hoping all the new variants will be as good.